Math Symbols: . . . why math symbols are used . . . Symbols are a concise way of giving lengthy instructions related to numbers and logic. Symbols are a communication tool. Symbols are used to eliminate the need to write long, plain language instructions to describe calculations and other processes. For example, a single symbol stands for the entire process for addition. The familiar plus sign eliminates the need for a long written explanation of what addition means and how to accomplish it. The same symbols are used worldwide . . . The symbols used in mathematics are universal. The same math symbols are used throughout the civilized world. In most cases each symbol gives the same clear, precise meaning to every reader, regardless of the language they speak. The most valuable, most frequently used Symbols in mathematics . . . The most important, most frequently used Grouping symbols are listed below. If there are three levels of grouping in a nested expression, generally parentheses are used in the inner most groupings. Square brackets are used in the next higher level grouping, and braces are used in the most outer groupings. All mathematical expressions must be evaluated in PEMDAS order to arrive at the correct answer. If there are several nested parentheses, begin by evaluating the innermost parentheses first - before you do anything else. After evaluating the innermost parentheses, evaluate the next innermost parentheses, and so on - until there are no parentheses left. If there are several non-nested parentheses, evaluate every one of them separately - before you do anything else. first : evaluation of the expression inside the inner most brackets . 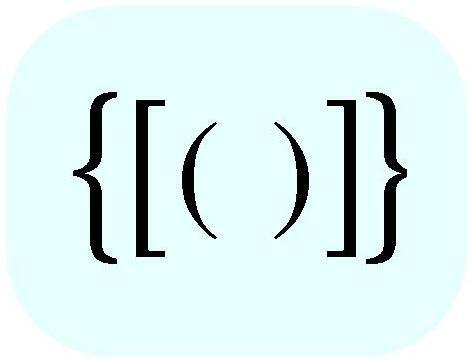 . .
"P" - The parentheses are the math symbols which represent the innermost bracket grouping. There are no additional bracket groupings to evaluate inside the parentheses. "E" - no exponents to evaluate inside the parentheses. "M" - no multiplication to evaluate inside the parentheses. "D" - no division to evaluate inside the parentheses. "S" - no subtraction to evaluate inside the parentheses. second : evaluation of the expression inside the middle brackets . 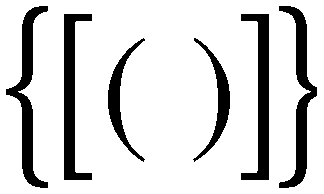 . .
"P" - The square brackets are the math symbols which represent the middle bracket grouping. "E" - no exponents to evaluate inside the middle bracket grouping. "D" - no division to evaluate inside the middle backet grouping. third : evaluation of the expression inside the outer brackets . . .
"P" - The curly brackets are the math symbols which represent the outer bracket grouping. "E" - no exponents to evaluate inside the outer bracket grouping. "M" - no multiplication to evaluate inside the outer backet grouping. "A" - no addition to evaluate within the outer backet grouping.